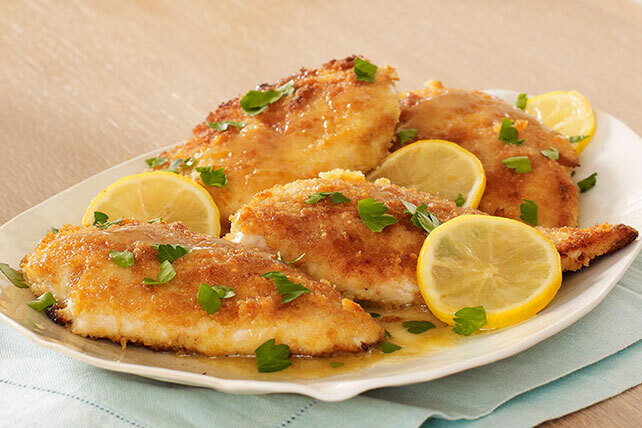 Bring together crispy chicken, fresh lemon juice & capers in this Lemon-Chicken Piccata Recipe. Serve a Lemon-Chicken Piccata Recipe any night of the week. Cut half of 1 lemon into 4 thin slices; squeeze juice from remaining 2-1/2 lemons. Coat chicken with mayo, then cracker crumbs. Heat oil in large skillet on medium-high heat. Add chicken; cook 5 min. Turn; cook on medium heat 5 min. or until chicken is golden brown on both sides and done (165ºF). Transfer chicken to platter; sprinkle with parsley. Cover to keep warm. Carefully wipe any crumbs from skillet with paper towel. Add lemon juice and broth to skillet; cook on medium-high heat 6 to 8 min. or until slightly reduced, stirring occasionally. Add butter, lemon slices and capers; cook and stir on low heat 3 to 4 min. or until butter is melted and lemons are heated through. Serve over chicken. Serve over hot cooked angel hair pasta. You should get about 3/4 cup juice from the 2-1/2 lemons.